Vecino Health Centers receives Health Center Quality Leader award! 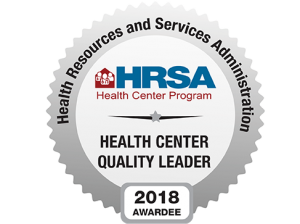 The prestigious national award is given to health centers with the best (top 30%) overall clinical performance among all health centers nationally. HRSA awards recognize the highest performing health centers nationwide. Of the 1,400 community health centers in the nation, Vecino is one of just 373 centers receiving the Quality Leader recognition in 2018. Congratulations to all staff and board members for your work that made this recognition possible. And thank you to our communities and patients for entrusting Vecino’s Airline Children’s Clinic and Denver Harbor Family Clinic with your family health care. Vecino Health Centers is a private nonprofit organization committed to making quality healthcare accessible to Houston’s working families. Established in 2001, Vecino is a Federally Qualified Health Center operating two locations in Houston: Denver Harbor Family Clinic and Airline Children’s Clinic. Through a unique partnership, Denver Harbor Family Clinic is home of Houston Methodist Family Medicine Residency Program.